Nestling on the southern slopes of the hill village of Goult, Les Vergers has a stunning view of the mountain range of the Luberon. The house is a single story villa, set in half an acre (1400 m2) of secluded garden with its own 10x5m swimming pool. The terrace by the pool has a barbeque and shaded eating area. There are plenty of sun loungers, or you can play a game of table tennis. You can enjoy an evening drink beside the pool, and watch the sun set behind the mountain across the valley. There is a shaded terrace in front of the house with outdoor dining table. The large sitting room (with a wood burning stove) opens onto a south-facing terrace with views to the Luberon. There is wireless internet access (no charge), and a TV with a DVD player. An archway leads into the traditional Provencal kitchen equipped with large refrigerator, freezer, ice-maker, gas hob, electric oven and a microwave. There are three bedrooms: one king size, one queen size, one with two singles with ensuite shower room and toilet. All bedrooms have a chest of drawers and a wardrobe. The bathroom has a modern walk-in shower, washbasin and toilet. there is a heated towel rail and a washing machine. Bed linen, towels and pool towels are included in the rent. Anne and Colin have been in love with Provence for over 30 years. We have spent all our family holidays getting to know the region and its people. Now our 3 grown up children (and grand children) still want to spend time with us in Goult, and share the relaxing atmosphere of the Luberon. Colin is a surgeon, Anne worked in education. We can unwind completely at Les Vergers, sinking into a leisurely holiday rhythm, and soaking up the sunshine. Step out of the front door every morning and see the constantly changing colours of light as the rising sun makes a moving pattern of shadows on the ridges and gullies of the mountain across the valley. The garden has a secluded private pool, and stunning uninterrupted views across the valley. Enjoy the setting sun on the terrace by the pool, and eat dinner outside, cooked on our large fixed BBQ. Within 5 minutes walk there is a baker, general stores, butcher, 4 restaurants,a pizza shop and a cafe-bar. Wine lovers can find excellent value and quality a short drive from home. Street markets sell local produce within easy reach every day. Tennis courts 3 minutes walk, cycle hire close by, and quiet back roads for running a 3 mile/5km route around the village if you have the energy! toilet, shower, walk-in shower with spray/rain options. Heated towel rail. The view across the valley changes by the hour. Every morning the Luberon mountain looks different, as the sun catches the ridges and gullies, and the setting sun gives it a golden halo. It is just beautiful! Great location. Everything you need. Charming village. thanks for your appreciation Heather, and for booking 3 weeks in 2019! Lovely house on the edge of a picturesque village. House is very well equipped with large private pool and landscaped gardens. Bedrooms were airy and very well proportioned. Goult is nicely located for day trips not just the "Peter Mayle" Provence villages. We visited Avignon, Orange, Nimes and Mont Ventoux. We spent two weeks in this lovely property. It is very comfortable and well equipped. It boasts a big swimming pool which was a wonderful resource in the hot weather. The owner and his agent are very accessible and helpful. Although not in the old part of the village, it very private and quiet and is not much more than five minutes walk from the village square near bakery, general store, and four good restaurants. The village itself, although equidistant from Gordes and Rousillion, two lovely, very touristy villages, Goult is very picturesque but relatively quiet and residential. We (2 adults) arrived at this house in Goult on Saturday 5/13/17 at 4pm and vacated the premises by 11am the following morning. Why? We chose this house because we wanted to relax by a private pool in a peaceful and comfortable environment. In fact, the pool was filthy and the entire pool area was unprepared for use. The umbrellas were not set up, there were no cushions on the patio lounges, and the house was largely unmaintained. When the owner was contacted he told us he would try to arrange for the pool company to arrive on Monday to clean the pool. ( We later learned that the cleaner would also have to repair the faulty pool cover.) For us who had paid almost $2,000 in advance for a week at a villa with a private pool in 70 and 80 degree weather, this was not acceptable. Our decision to leave was made because we had only one week for our holiday in the south of France. We were unwilling to lose the rest of Saturday, Sunday and Monday and very possibly longer to wait while the pool was prepared. That being said, the house was also not as promised. It shared the same level of neglect as the garden and pool. There were cobwebs in the corners of the back bedroom, stains on the furniture and one of the lampshades, and gave an overall impression of being unclean. The refrigerator/freezer was dirty and still contained the previous tenant’s butter and frozen pizza. There was a frying pan in a drawer that was covered in some kind of grease and clearly had not been washed by the last person who used it. My companion and I decided to leave rather than than stay in an unclean and uncared for property. We advised the owner and the manager of our dissatisfaction and left the house after using only two bedrooms and the bathroom. We asked for fair compensation for the loss of use of the pool and the anticipated loss of peace and privacy while it was being cleaned and repaired. This entire experience was a hardship for us. Although we were finally refunded our damage deposit on 5/24/17, the owner has been unwilling to provide any other compensation. We have rented vacation houses from VRBO in the south of France and in Greece on multiple occasions for years. This is the first rental we were required to pay a $112 fee on top of the rental fee. This is also the first time we rented a house that was not what was promised. We should not have disregarded a previous renter’s review from 2016 that noted her experience with the owner. We spend about three months each year in this property, to us it is home, and we have high standards. We are pleased to share our home with discerning visitors. So let’s examine the facts. This traveller, we will call her DT, made a reservation enquiry at the beginning of April. I accepted the booking within 29 minutes. Later DT wrote to say she preferred to stay elsewhere. In her email to me DT said: “We have booked with VRBO for many years but they have changed their process and we made a mistake. We feel like idiots”. I confirmed our policy, we give a full refund if we can let the property to someone else. DT decided to stay in our house anyway. DT paid the week’s rent of €1250 (about USD1400 – not ‘nearly 2000’), plus a refundable damage deposit, and the HomeAway booking fee added by the website. We don’t like that fee either, we get some surprised comments from our guests, but the fee is charged by HomeAway, not by the owner. In early May the weather is usually too cold for swimming, so we set up the pool in mid-May. I always mention this when replying to enquiries, but DT made the booking reservation as her first contact. This year has been exceptionally warm and I can see why DT asked for the pool when she arrived on Saturday afternoon. I arranged for our poolman to come on the Monday to set up. DT wouldn’t wait until then and left on the Sunday. In the discussions I had with DT she didn’t mention any problems in the house. Our managing agents spend 4 hours cleaning after every guest (even if they stay for only one night), and I defy anyone to show me that our home is ‘uncared for’! Just look at the photos! I am surprised that a few things in the freezer, in a drawer marked ‘Please Leave’, could offend anyone. We refunded the damage deposit on May 24th, a few days after DT’s booking (May 13-20). I wasn’t able to establish with certainty how it got jammed, so I decided to bear the cost of fixing that myself. Beautiful view over the Luberon and fabulous pool, walking distance from lovely village. The house served the needs of four adults well - comfortable, convenient especially as the weather was perfect and we spent much of the time outside on the terrace and in the pool. The kitchen is on the small side but generally well equipped, the lounge very spacious and comfortable. It's a short uphill walk to the beautiful historic village of Goult which has very good shops and the excellent Café de la Poste. Not many properties or locations totally live up to expectations but this one does. 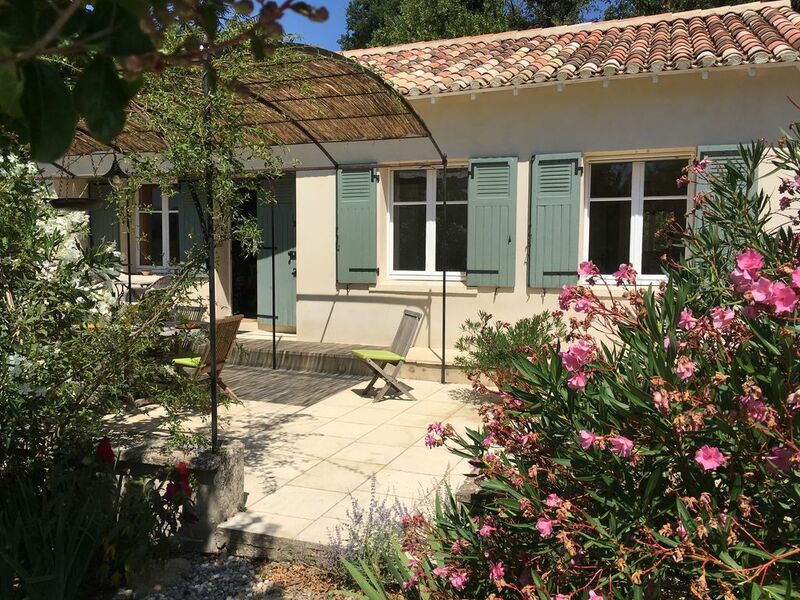 We stayed at Les Verges for one week as a family of four with two children aged 16 & 10 and it was perfect for our first foray to Southern France. We would return without hesitation in the future. The house is lovely inside and out with loads of space, everything easily caters for six, and the swimming pool which was the main selling point for us was fantastic, the kids were in heaven for a week! We had trouble finding the house but this was due to relying solely on Sat Nav which took us up a nearby lane - having the actual house number provided would have helped. Home away rescued us though, thanks! The village itself is also beautiful, we explored others in the area and would say Goult is one of the prettiest. The amenities are also excellent, especially the bakers and the pub/cafe from where you can sit, enjoy a drink and watch the world go by. The takeaway pizza opposite the cafe is also great (you can order your pizza and then eat it at the cafe as it doesn't serve food in the evenings) but this got very very busy when we were there - someone has a great opportunity to start a pizza/pasta restaurant as an alternative to the established French cuisine ones; they would do a great trade! Thank you for your review, it is spot on! Many people are surprised to learn that house numbers are a very recent innovation (this year!) in our part of France.